Even 15,000 years ago, humans were compelled to decorate the interior walls of their abodes. Back then, in the Stone Age, home was often no more than a cave, but the artwork was sophisticated and sublime. 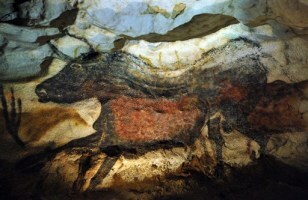 The Altamira Cave in northern Spain contains some of Europe's best known and best preserved Paleolithic rock art, including the painted ceiling shown here. Scholars consider the paintings, primarily of bison and other wildlife, masterpieces of creative genius. Click the "Next" label to see seven more examples of rock art from around the world. 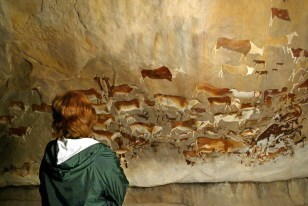 The famed Lascaux caves in France have been shuttered since 1963, when green algae and mosses began to cover the 15,000- to 17,000 year-old murals of bulls, horses, and other creatures. The deterioration was blamed on chemical reactions with visitors' breath. As a consolation, the government built a replica cavern nearby, which remains a top tourist draw. But the spread of fungus in the original cave hasn't stopped, thanks in part to global warming, researchers said at a recent meeting about the artwork. Ideas to fight the fungus include the use of biocides and an elaborate climate control system. Rock art in Britain appears to date back at least 12,800 years, according to scientists who used minute traces of radioactive uranium in a limestone crust to date the rock art. The crusts formed over the etchings of bison and other creatures, so the dates set a minimum age for the work. The finding helps round out a picture of Ice Age Ice-Age hunter-gatherers occupying the caves each spring to find horse, reindeer, and other wildlife for meat, hides, and fur. 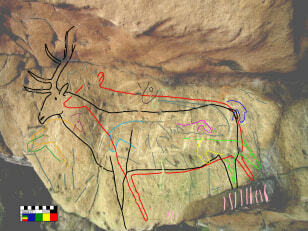 This overdrawn image here shows a stag engraving in the biggest cavern at Creswell Crags. 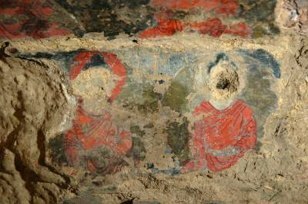 The world's earliest known oil paintings are found in a series of intact - albeit weather-beaten and looter-ravaged - caves in Afghanistan's Bamiyan Valley. Archaeologists dated the paintings to the mid-seventh century, which is several hundred years before the painting technique emerged in Europe. The murals depict Buddhas and mythical creatures and were made with what appear to be walnut and poppy-seed oils, scientists say. The site of the paintings is perhaps more infamously known as where the Taliban blew up two giant stone Buddha statues in 2001. Painted walls and overhangs in South Africa are helping scholars piece together the millennia-long history of the San, a group of hunter-gatherers who became extinct after European colonization in the 19th century. 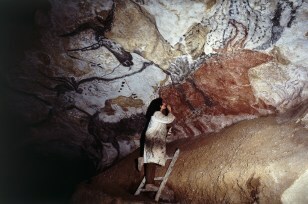 More than 40,000 paintings in 500 rock shelters have been discovered. They depict animals such as the eland - a type of spiral-horned antelope - and hunters and are thought to represent religious beliefs of the San. Researchers hope that by firmly dating the paintings, they can see how the people changed over time. 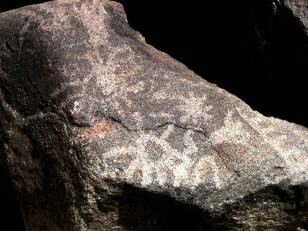 The star symbol right of center in this rock carving may represent the fiery death of an ancient star in the year 1006. If so, it would be the first North American representation of a celestial event, previously known from astronomers' records in Asia, the Middle East, and Europe. The supernova of 1006 was likely as bright as the quarter moon, according to computer simulations. This piece of rock art was discovered in the White Tank Regional Park outside of Phoenix, Ariz. Figures and shapes etched into rocks all around Nevada hint at stories of people who roamed the land centuries to millennia ago. But rock art enthusiasts fear vandals and looters will destroy the etchings before scientists have sufficient tools and knowledge to comprehend the historical record. 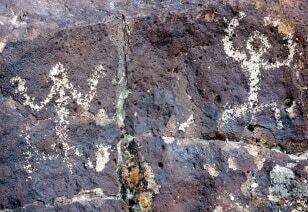 The problem, according to groups mobilizing to protect the ancient artwork, is Nevada's rapid growth, which is putting people much closer to sites such as the petroglyphs shown here in the Pah Rah Mountain Range near Reno. The more than 10,000 carvings and paintings of bulls, sheep, hunters, the hunted, warriors and wildlife all etched and stroked onto the cliff walls along Utah's Nine Mile Canyon make up what is known as the world's longest art gallery. The rock art dates to between A.D. 700 and 1300 and archaeologists believe it is the creation of the Fremont people, who were the ancestors of modern-day Utes. But the rock isn't the only draw to the remote stretch of Utah: It's also rich in oil and gas. 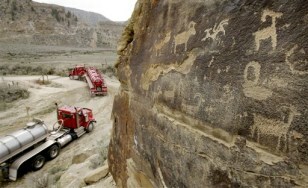 A rush to exploit the natural resources has raised concerns that dust kicked up by industrial truck traffic could harm the artwork.